The commercial real estate market is currently experiencing considerable difficulty for two distinct reasons. First, the current economic downturn has resulted in a dramatic deterioration of commercial real estate fundamentals. Increasing vacancy rates and falling rental prices present problems for all commercial real estate loans. Decreased cash flows will affect the ability of borrowers to make required loan payments. Falling commercial property values result in higher LTV ratios, making it harder for borrowers to refinance under current terms regardless of the soundness of the original financing, the quality of the property, and whether the loan is performing. Second, the development of the commercial real estate bubble, as discussed above, resulted in the origination of a significant amount of commercial real estate loans based on dramatically weakened underwriting standards. These loans were based on overly aggressive rental or cash flow projections (or projections that were only sustainable under bubble conditions), had higher levels of allowable leverage, and were not soundly underwritten. Loans of this sort (somewhat analogous to “Alt-A” residential loans) will encounter far greater difficulty as projections fail to materialize on already excessively leveraged commercial properties. The health of the commercial real estate market depends on the health of the overall economy. Consequently, the market fundamentals will likely stay weak for the foreseeable future. This means that even soundly financed projects will encounter difficulties. Those projects that were not soundly underwritten will likely encounter far greater difficulty as aggressive rental growth or cash flow projections fail to materialize, property values drop, and LTV ratios rise on already excessively leveraged properties. New and partially constructed properties are experiencing the biggest problems with vacancy and cash flow issues (leading to a higher number of loan defaults and higher loss severity rates than other commercial property loans). For the last several quarters, average vacancy rates have been rising and average rental prices have been falling for all major commercial property types. 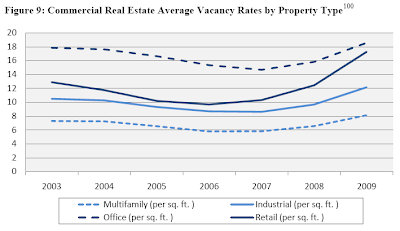 Current average vacancy rates and rental prices have been buffered by the long-term leases held by many commercial properties (e.g., office and industrial). The combination of negative net absorption rates and additional space that will become available from projects started during the boom years will cause vacancy rates to remain high, and will continue putting downward pressure on rental prices for all major commercial property types. Taken together, this falling demand and already excessive supply of commercial property will cause many projects to be viable no longer, as properties lose, or are unable to obtain, tenants and as cash flows (actual or projected) fall. In addition to deteriorating market fundamentals, the price of commercial property has plummeted. 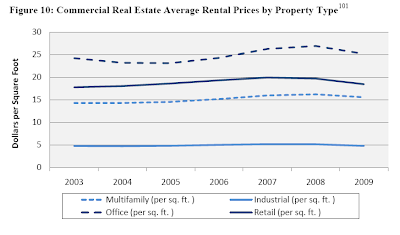 As seen in the following chart, commercial property values have fallen over 40 percent since the beginning of 2007. For financial institutions, the ultimate impact of the commercial real estate whole loan problem will fall disproportionately on smaller regional and community banks that have higher concentrations of, and exposure to, such loans than larger national or money center banks. The impact of commercial real estate problems on the various holders of CMBS and other participants in the CMBS markets is more difficult to predict. The experience of the last two years, however, indicates that both risks can be serious threats to the institutions and borrowers involved. Although banks with over $10 billion in assets hold over half of commercial banks’ total commercial real estate whole loans, the mid-size and smaller banks face the greatest exposure. The current distribution of commercial real estate loans may be particularly problematic for the small business community because smaller regional and community banks with substantial commercial real estate exposure account for almost half of small business loans. For example, smaller banks with the highest exposure – commercial real estate loans in excess of three times Tier 1 capital – provide around 40 percent of all small business loans. Foresight Analytics, a California-based firm specializing in real estate market research and analysis, calculates banks’ exposure to commercial real estate to be even higher than that estimated by the Federal Reserve. Drawing on bank regulatory filings, including call reports and thrift financial reports, Foresight estimates that the total commercial real estate loan exposure of commercial banks is $1.9 trillion compared to the $1.5 trillion Federal Reserve estimate. The 20 largest banks, those with assets greater than $100 billion, hold $600.5 billion in commercial real estate loans. As seen in the Foresight Analytics data above, the mid-size and smaller institutions have the largest percentage of “CRE Concentration” banks compared to total banks within their respective asset class. This percentage is especially high in banks with $1 billion to $10 billion in assets. The table above emphasizes the heightened commercial real estate exposure compared to total capital in banks with $100 million to $10 billion in assets. Equally troubling, at least six of the nineteen stress-tested bank-holding companies have whole loan exposures in excess of 100 percent of Tier 1 risk-based capital. In the years preceding the current crisis, a series of trends pushed smaller and community banks toward greater concentration of their lending activities in commercial real estate. Simultaneously, higher quality commercial real estate projects tended to secure their financing in the CMBS market. As a result, if and when a crisis in commercial real estate develops, smaller and community banks will have greater exposure to lower quality investments, making them uniquely vulnerable. As loan delinquency rates rise, many commercial real estate loans are expected to default prior to maturity. For loans that reach maturity, borrowers may face difficulty refinancing either because credit markets are too tight or because the loans do not qualify under new, stricter underwriting standards. If the borrowers cannot refinance, financial institutions may face the unenviable task of determining how best to recover their investments or minimize their losses: restructuring or extending the term of existing loans or foreclosure or liquidation. On the other hand, borrowers may decide to walk away from projects or properties if they are unwilling to accept terms that are unfavorable or fear the properties will not generate sufficient cash flows or operating income either to service new debt or to generate a future profit. 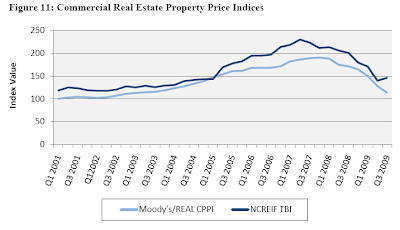 Although many analysts and Treasury officials believe that the commercial real estate problem is one that the economy can manage through, and analysts believe that the current condition of commercial real estate, in isolation, does not pose a systemic risk to the banking system, rising delinquency rates foreshadow continuing deterioration in the commercial real estate market. 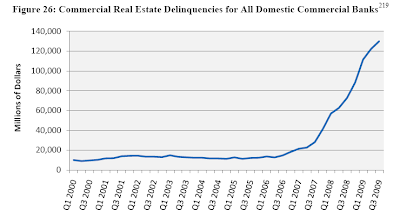 For the last several quarters, delinquency rates have been rising significantly. The extent of ultimate commercial real estate losses is yet to be determined; however, large loan losses and the failure of some small and regional banks appear to some experienced analysts to be inevitable. New 30-day delinquency rates across commercial property types continue to rise, suggesting that commercial real estate loan performance will continue to deteriorate. However, there is some indication that the rate of growth, or pace of deterioration, is slowing. Unsurprisingly, the increase in delinquency rates has translated into rapidly rising default rates. 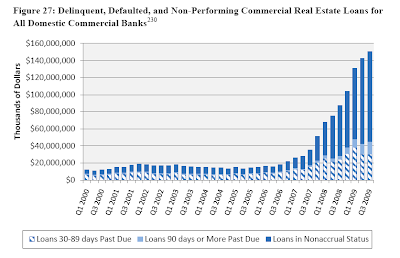 The increasing number of delinquent, defaulted, and non-performing commercial real estate loans also reflects increasing levels of loan risks. Loan risks for borrowers and lenders fall into two categories: credit risk and term risk. Credit risk can lead to loan defaults prior to maturity; such defaults generally occur when a loan has negative equity and cash flows from the property are insufficient to service the debt, as measured by the debt service coverage ratio (DSCR). If the DSCR falls below one, and stays below one for a sufficiently long period of time, the borrower may decide to default rather than continue to invest time, money, or energy in the property. The borrower will have little incentive to keep a property that is without equity and is not generating enough income to service the debt, especially if he does not expect the cash flow situation to improve because of increasing vacancy rates and falling rental prices. Commercial real estate problems exacerbate rising unemployment rates and declining consumer spending. Approximately nine million jobs are generated or supported by commercial real estate including jobs in construction, architecture, interior design, engineering, building maintenance and security, landscaping, cleaning services, management, leasing, investment and mortgage lending, and accounting and legal services. Projects that are being stalled or canceled and properties with vacancy issues are leading to layoffs. Lower commercial property values and rising defaults are causing erosion in retirement savings, as institutional investors, such as pension plans, suffer further losses. Decreasing values also reduce the amount of tax revenue and fees to state and local governments, which in turn impacts the amount of funding for public services such as education and law enforcement. Finally, problems in the commercial real estate market can further reduce confidence in the financial system and the economy as a whole. To make matters worse, the credit contraction that has resulted from the overexposure of financial institutions to commercial real estate loans, particularly for smaller regional and community banks, will result in a “negative feedback loop” that suppresses economic recovery and the return of capital to the commercial real estate market. The fewer loans that are available for businesses, particularly small businesses, will hamper employment growth, which could contribute to higher vacancy rates and further problems in the commercial real estate market. There is a commercial real estate crisis on the horizon, and there are no easy solutions to the risks commercial real estate may pose to the financial system and the public. An extended severe recession and continuing high levels of unemployment can drive up the LTVs, and add to the difficulties of refinancing for even solidly underwritten properties. But delaying write-downs in advance of a hoped-for recovery in mid- and longer-term property valuations also runs the risk of postponing recognition of the costs that must ultimately be absorbed by the financial system to eliminate the commercial real estate overhang. Any approach to the problem raises issues previously identified by the Panel: the creation of moral hazard, subsidization of financial institutions, and providing a floor under otherwise seriously undercapitalized institutions. There appears to be a consensus, strongly supported by current data, that commercial real estate markets will suffer substantial difficulties for a number of years. Those difficulties can weigh heavily on depository institutions, particularly mid-size and community banks that hold a greater amount of commercial real estate mortgages relative to total size than larger institutions, and have – especially in the case of community banks – far less margin for error. But some aspects of the structure of the commercial real estate markets, including the heavy reliance on CMBS (themselves backed in some cases by CDS) and the fact that at least one of the nation’s largest financial institutions holds a substantial portfolio of problem loans, mean that the potential for a larger impact is also present. There is no way to predict with assurance whether an economic recovery of sufficient strength will occur to reduce these risks before the large-scale need for commercial mortgage refinancing that is expected to begin in 2011-2013. At 190 pages, that was a very detailed report. One key take away is the huge numbers of banks at risk of failure as noted in Figure 19. There are 358 banks in the size of $1 to $10 billion with excessive CRE concentrations. There are an additional 2,115 banks in the size of $100 million to $1 billion with excessive CRE concentrations. 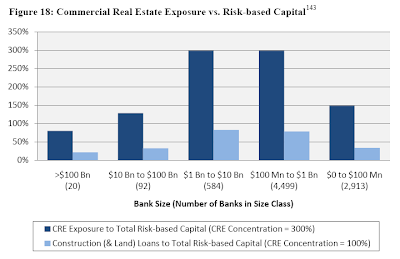 Only 1 of the top 20 banks (greater than $100 billion) has excessive CRE concentrations. However, because of size, that 1 is important as well. Certainly not all of those banks will fail, but hundreds of them will. Moreover, of all the banks, a whopping 2,988 out of 8,108 have excessive CRE concentrations. 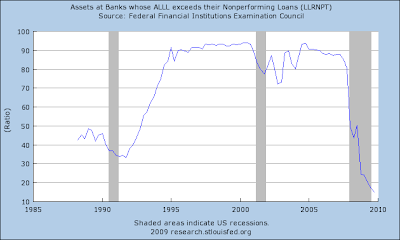 With inadequate loan loss provisions as noted in the following chart, is it any wonder banks are not lending? Because allowances for loan and lease losses (ALLL) are a direct hit to earnings, and because allowances are at ridiculously low levels, bank earnings (and capitalization ratios) are wildly over-stated. The report noted that "Treasury officials believe that the commercial real estate problem is one that the economy can manage through, and analysts believe that the current condition of commercial real estate, in isolation, does not pose a systemic risk to the banking system." The key words in that paragraph are "in isolation". What about credit card defaults? What about another wave down in housing? What about the cumulative effect of banks being so undercapitalized they could not lend if they wanted to? What if more businesses decide to walk away for properties? What happens to mortgage rates and rates for commercial loans when the Fed stops buying mortgage backed securities? A quick look at the above questions shows risk is overwhelmingly to the downside. Here is the key question as far as the "recovery" goes. Where is the source of jobs with all the above constraints and questions? As I suggested in Yield Curve Steepest In History: Is The Meaning Different This Time? Those who think the steep yield curve guarantees the economy will soon be humming are in for a rude awakening. In the aftermath of a deflationary credit bust, credit conditions, debt levels, and attitudes are far more important than a steep yield curve, and those conditions are god awful. Add commercial real estate to the list of conditions that are god awful. Perhaps the economic miracle fairy waves her wand and cures all of these systemic risks, but I would not bet on it.